Photo courtesy of Courtesy of Hollygrove Market & Farm. Hollygrove Market & Farm (HM&F) has shortened the food distribution chain to zero by combining an urban farm with a grocery store. For many area residents in New Orleans’ 17th Ward, HM&F is their only source of affordable, local fresh food. HM&F goes out of its way to provide healthy food choices by letting customers choose from purchasing single items or CSA-style food boxes. HM&F began as part of the Carrollton-Hollygrove Community Development Corporation. In the past they have enjoyed support from area organizations including the New Orleans Food & Farm Network and the Master Gardeners of New Orleans. The store provides access to fresh, local food to a community that desperately needs it. Founded in 2008, HM&F occupies approximately one city acre. Before Hurricane Katrina hit, a garden nursery had occupied the site. Today, the retail store sits next to the urban farm and community garden plots. Plot owners can sell their produce in the store or take it home. The organization is a popular one. Local residents show up every week to customize their CSA box. 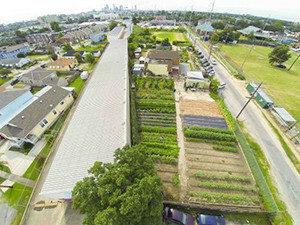 NOLA foodies have boxes of produce delivered to their neighborhood. HM&F has 10 full-time staff members, as well as mentor farmers that manage the farm and run the children’s garden club. Volunteers are plentiful and help in both the farm and the store. The company works with hobbyist and backyard growers as well as local and regional farmers. Fresh eggs, organic dairy products, free range meats, rice, coffee, tea, honey, nuts and a variety of fresh baked goods are available at the store. “We are totally self-sustaining through sales,” says Ma. Most of HM&F’s growth comes from customer reviews and word-of-mouth marketing. Local residents, college students and EBT card holders are all eligible for large discounts at the market to encourage use and fresh food access. HM&F provides well thought-out recipe ideas to their customers that cover all the items in the weekly food box in the form of a blog on their website. As well as aggregating local produce, HM&F uses its site to share sustainable farming techniques. Composting, cistern irrigation, recycling and organic gardening models demonstrate the possibilities of sustainable production. The HM&F children’s club teaches gardening skills and education on food origins and food choices. Currently HM&F serves approximately 400 local families. “As far as our reach goes, we’re always looking to be as big as people need us to be,” says Ma. Ma advises others considering an urban farm retail store model to focus on positive community relationships.